Everyone who knows me knows I have been wanting a Dutch Oven for YEARS. I even had the gall to put a request on my personal blog (Stuff I Would Like to Have). My mom surprised me with one three Christmases ago, but it got chipped during shipping and had to be returned. And as life often goes, the money from the dutch oven was then used to buy boots for my older daughter. Several weeks ago, however, I got a wonderful email out of the blue. 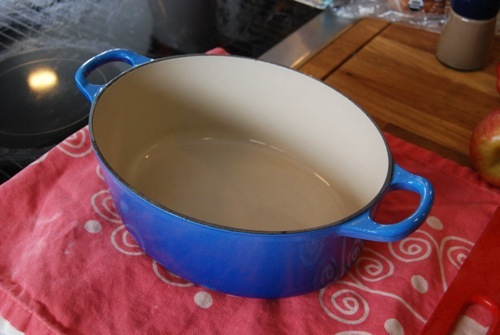 My dear friend, Magdalen (owner of multiple dutch ovens) had seen the “Stuff I Would Like to Have” page on my blog and was wondering whether she could offload her (as she put it) “Ugly Duckling” of the bunch. This small 3-quart Le Creuset was simply gathering dust. Would I be so kind as to take it off her hands..?? My response? SEND IMMEDIATELY. 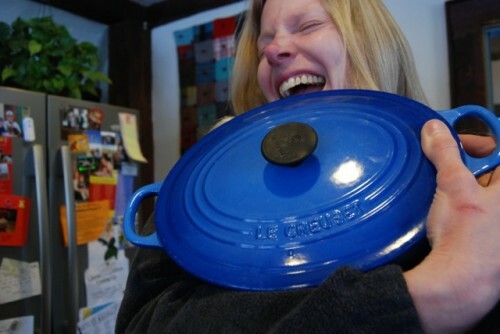 So many, MANY thanks to my amazing friend Magdalen, I’m now the proud owner of a beautiful blue Le Creuset!!!! When I opened it yesterday morning I was ECSTATIC! I’ve been wanting one for SO LONG. Now my only dilemma was WHAT TO MAKE FIRST?! Friends recommended everything from braised lamb shanks, pot roast, baked beans, short ribs and Osso Buco to a whole roasted chicken with veg. But when my dear friend Stephanie suggested an apple bake, I was sold. Could there be anything more warming on a cold winter day or more AMERICAN?! Luckily we had some crisp Fuji apples (my favorite) and some beautiful Bosc pears on hand, too. A few chops, an hour later and my beloved Dutch Oven was filling the house with the smell of success. 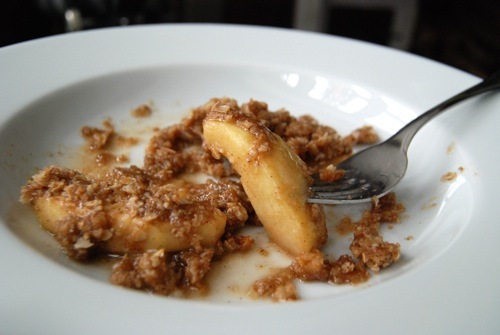 This apple pear crisp is a super sweet low sodium dessert – times THREE! Super easy to make, super easy to bake (thanks to my beloved Le Creuset) and SUPER easy to eat. The crisp topping is thick and crunchy and cookie-esque; the soft filling a dream. Vary the baking time to suit your own taste. 30 minutes for firm fruit, 45 minutes for flaccid. With a dutch oven doing the work, it’s all good! Preheat the oven to 350 degrees. Butter the inside of a dutch oven and set aside. 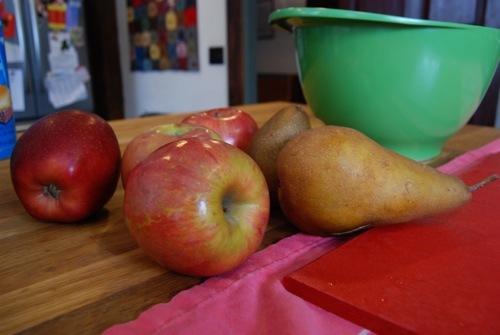 Peel the apples and pears, core, then slice into a mixing bowl. Add sugar and stir to coat evenly. 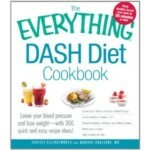 Pour into the greased dutch oven and set aside. 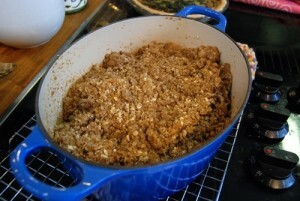 To make the crisp topping, measure the dry ingredients into a large mixing bowl and stir well to combine. Pour in the vanilla and toss, then cut in the butter using your (freshly washed) hands. Work the butter into the mixture, squeezing back and forth in your hands as if you were forming snowballs. 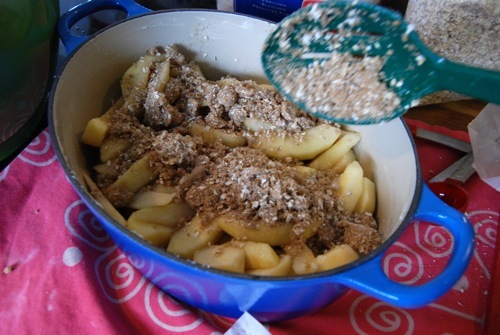 Keep working until butter is evenly divided and all crumbs are moist. Some lumps will remain – that’s great. Spoon topping over the fruit, covering completely. 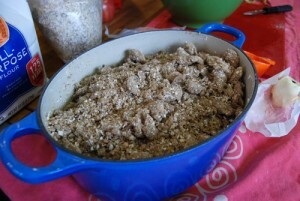 Place the dutch oven on the middle rack in oven and bake until golden brown on top. 30 minutes for firm fruit, 45 minutes for very soft. Remove dutch oven at the end of baking time and set on a wire rack to cool slightly. 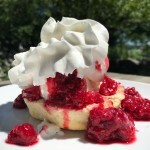 Serve crisp warm or cold, topped with whipped cream, heavy cream or ice cream, if desired. Looks divine — and I’m so glad you made it not me (I can handle the sodium; it’s the sugar I’m not allowed). Plus, you have now literally used that dutch oven more in the past three days that I have in the past three years. Cooked apples are one of the VERY BEST things in life. That last picture is making me drool. Relatedly, Kamran and I went to a place for dinner the other night that had “trio of apple cobblers” on their menu, and we were like, “Slurpglobdroolglug.” But when it came out, it was just one apple cobbler. It turns out they used three different kinds of apples and meant “trio of apples cobbler”. Funny how one misplaced S can ruin a night. Dear Magdalen, I wish I had something to gift you that was equally amazing. But as I am an unpaid blogger, I will just have to keep massaging your ego w/ my words. Magdalen is awesome. Magdalen is wonderful. Magdalen is the best friend anyone could have. A triumph of talent as well as generosity, Magdalen’s wonders know no bounds, Magdalen is..
Katie, that misplaced S is Seriously Hitty. Oops. Missed an S too. 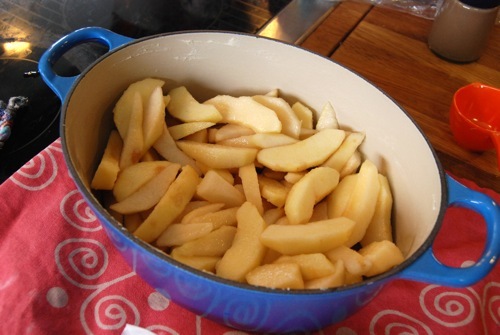 I’m looking forward to making the Dutch Oven Apple Pear Crisp! I just heard about coconut sugar. Do you think I could use and equal substitute for the brown sugar? 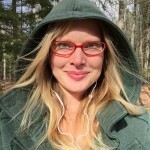 Thanks again for your awesome website! !